A real paradise for mountain fans surrounded by mighty summits beyond 3000 meters above sea level: the unique Ötztal Nature Park has a varied choice of trails and tours for all skill levels. Therefore the Ötztal Valley is the perfect place for your hiking and climbing holidays in the Tyrolean mountains. Relaxing walking tours, challenging tours to mountain peaks, stunning view points and rustic mountain huts. You will benefit from an excellent extended network of hiking tracks, covering more than 1300 km. Get to know more about the varied Alpine fauna and flora along the Alpine Ecology Trails or enjoy a more leisurely tour on the historical tracks of the Ötztal Urweg Trail. 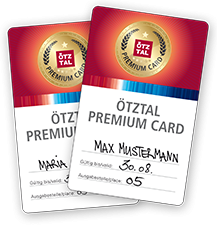 The Ötztal Arena Tourist Board and the Mountaineering Schools of Sölden and Vent came up with a varied program of guided walks and hikes – free of charge for all Ötztal Premium Card card holders. The Ötztal valley is a true biking paradise in the heart of Tyrol with an incredible variety of mountain biking and cycling trails in different difficulty levels. The approx. 700 km long mountain bike trails are perfectly signposted according to the MTB model and offer a big variety of activities for beginners and skilled bikers. From relaxed cycling ways down in the valley to single trails on the mountains – the selected routes cover everything from riding past blooming pastures to riding across spectacular debris slopes. Pedal away and enjoy beautiful views and a fantastic mountain scenery. The bikes can be transported on public means of transport without difficulty and even on the lifts. Bike rentals on site offer excellent bicycles in all categories, even E-BIKES. A Highlight for all race cyclists is a tour up to Rettenbach Glacier at 2,800 meters above sea level, Europe’s highest asphalt road for cyclists. There is nothing more vitalizing than a dive into Ötztal’s outdoor pools or swimming lakes after an exciting mountain bike or hiking tour. In case of inclement weather you can enjoy diving and sliding in our own indoor pool at Hotel Fiegl or at the Freizeit Arena indoor leisure center or restore your energies at the Aqua Dome spa and wellness temple. Outdoor activities in the Ötztal Valley guarantee a real adrenaline kick. Dancing with the elements – water, air and earth: exciting rafting tours, thrilling canyoning or kayaking experiences and unique rock climbing routes promise an unforgettable adventure. Tandem paraglide flights offer spectacular panoramic views. Supervision by true outdoor experts! Ötztal Valley is renowned as THE undisputed granite climbing hot spot in Tirol. Everyone will find his perfect climbing spot in 19 climbing gardens offering no less than 700 routes. What’s more, 7 via ferratas and numerous multi pitch tours provide climbing fans with unrivaled “vertical adventures”.